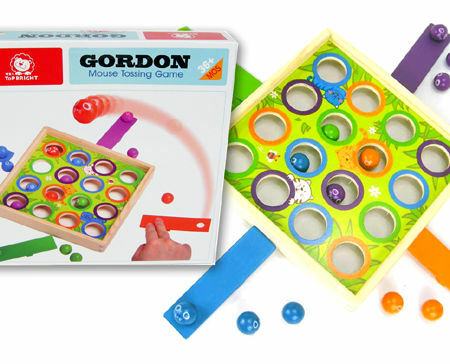 Wooden Mouse Tossing Marble Game is a game of luck and skill where you launch coloured marbles into the air and try to get them into holes on the game board. This set comes with 4 different coloured see-saw boards to launch your marbles. 12 marbles and a multi colour board. The idea is to try and get your marbles, decorated like a mouse into the corresponding color holes on the board to keep it safe from the pussycats. Material: Wood childsafe paint marbles. We like this because: "Great fun and a challenge to master. "